In 1946 two sisters Gwen and Ruth Nelson purchased Kereru Station. It was in poor condition and overrun with rabbits. They then purchased the adjacent Big Hill Station to carry the stock while they set about a comprehensive cull of the pest. Over 200,000 rabbits were killed. hey directed their energy and resources to restore the farming operations before on-selling Big Hill. Kereru Station was ﬁrst farmed by their grandfather, James Nelson Williams, who had purchased the property from the New Zealand Government in 1857. 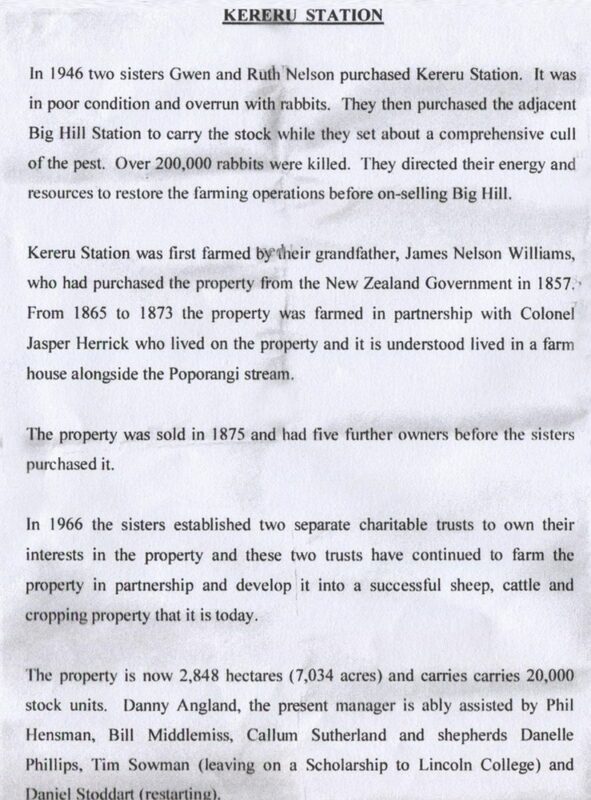 From 1865 to 1873 the property was farmed in partnership with Colonel Jasper Herrick who lived on the property and it is understood lived in a farm house alongside the Poporangi stream. The property was sold in 1875 and had ﬁve further owners before the sisters purchased it. In 1966 the sisters established two separate charitable trusts to own their interests in the property and these two trusts have continued to farm the property in partnership and develop it into a successful sheep, cattle and cropping property that it is today. The property is now 2,848 hectares (7,034 acres) and carries [carries] 20,000 stock units. Danny Angland, the present manager is ably assisted by Phil Hensman, Bill Middlemiss, Callum Sutherland and shepherds Danelle Phillips, Tim Sowman (leaving on a Scholarship to Lincoln College) and Daniel Stoddart (restarting). The farming income is shared equally between the two trusts. The Gwen Malden Charitable Trust supports general charitable organisations in the Hawke’s Bay and Gisborne districts and since 1980 has distributed in excess of $4 million to community causes. 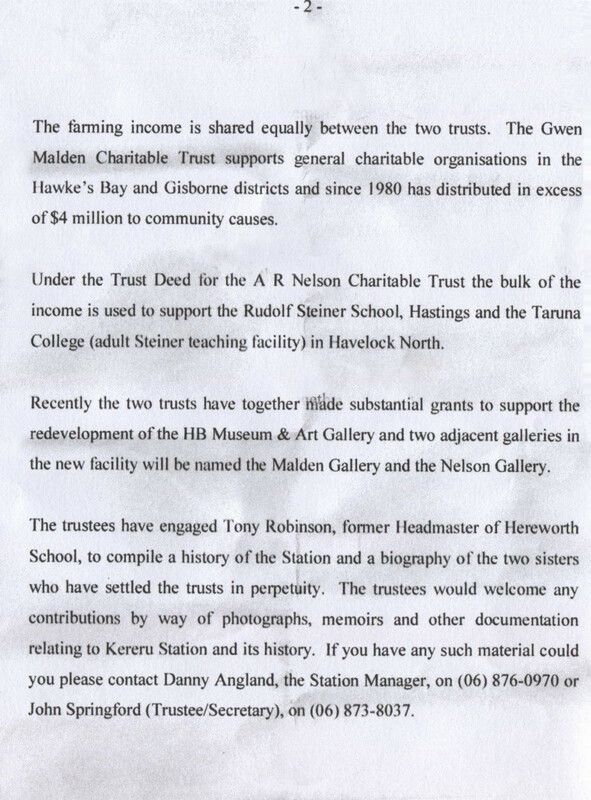 Under the Trust Deed for the A R Nelson Charitable Trust the bulk of the income is used to support the Rudolf Steiner School, Hastings and the Taruna College (adult Steiner teaching facility) in Havelock North. Recently the two trusts have together made substantial grants to support the redevelopment of the HB Museum & Art Gallery and two adjacent galleries in the new facility will be named the Malden Gallery and the Nelson Gallery. The trustees have engaged Tony Robinson, former Headmaster of Hereworth School, to compile a history of the Station and a biography of the two sisters who have settled the trusts in perpetuity. The trustees would welcome any contributions by way of photographs, memoirs and other documentation relating to Kereru Station and its history. If you have any such material could you please contact Danny Angland, the Station Manager, on (06) 876-0970 or John Springford (Trustee/Secretary), on (06) 873-8037.